Although it has been two years since the adoption of the latest Minimum Standard Detail Requirements for ALTA/NSPS Surveys, there continues to be some misunderstanding and confusion with regard to the location of utilities. The most significant change to the 2016 requirements was the elimination of what was known in the 2011 version as Optional Table A Item 11(a) – Location of Utilities. With its removal from the optional listing, all of its definition was moved into Section 5.E.iv. of the 2016 Minimum Standards. This change now requires surveyors performing surveys work in accordance to the new Standards, to locate, report and show any OBSERVED evidence of a utility on, over or beneath the ground that either provides service to the surveyed property or crosses the property to serve others. This includes, but is not limited to visual appurtenances such as pipeline markers, manholes, valves, meters, transformers, pedestals, clean-outs, utility poles, overhead lines and guy wires. What was previously known in the 2011 Optional Table A listing as Item 11(b), is now defined as Table A Item 11 in the 2016 listing. In both the old 2011 and new 2016 standards, the surveyor is required to not only report OBSERVED evidence of utilities, but to also employ methods stated within the definition to locate UNDERGROUND features. The surveyor can look to plans provided by the client such as site or development plans, as-built or prior surveys, or plans obtained from utility companies. The surveyor can also attempt to request ground markings of underground features from a utility locator service. Whatever the source, the surveyor should state and reference which methods were utilized to report these locations. Confusion between former Optional Table A Item 11 and current Optional Table A Item 11 arises when parties relying on the survey believe that the only way to capture utility information and have it shown on the survey is when the 2016 definition of Optional Table A Item 11 is included in the scope of the project. That is not the case at all. 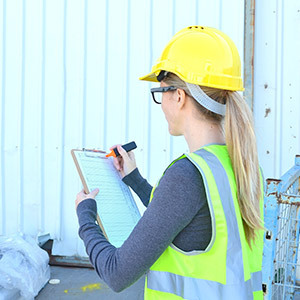 The surveyor must always address, report and show any OBSERVED evidence pursuant to responsibilities in Section 5.E.iv of the Minimum Standards. The inclusion of Optional Item 11 should be considered when there is a need to understand a view of the underground services. Item 11 will add to the cost of the survey and will most likely extend the timing of delivery. Please refer to the " User Guide to Table A Items" on page 21 of the Bock & Clark Handbook for further explanations. Property Condition Assessments: Should I Order the PCA? A Property Condition Assessment (PCA) is a valuable tool that provides additional insight to transaction parties by reporting a clear picture of the current condition of a property, as well a future projection of anticipated capital expenditures for that property. The PCA identifies immediate needs (code violations, fire hazards, life safety concerns), short term needs (deferred maintenance or repairs that should take place within 2 years) and includes a Replacement Reserve Table that identifies repairs anticipated to be required during the evaluation period based on the remaining useful life and estimated useful life of building elements. PCAs are utilized by various parties to support their financial modeling of a given property. Following are some examples. Lenders - Usually used during loan origination, the PCA informs a lender of the actual condition of the property and if any deferred maintenance is required. A lender can then protect the investment by holding monies in escrow to address the deferred maintenance identified during the study. The PCA is also commonly used in the refinancing process and provides a lender with insight as to how the property is being maintained by providing a snapshot of current conditions which can assist in property valuation. Buyers - The PCA can be used as a tool to negotiate the purchase price of the property if deferred maintenance or other capital expenditures are recommended. Additionally, the inclusion of the Replacement Reserve Summary can help a buyer understand upcoming expenditures that might be required to appropriately maintain the property. Sellers – To highlight selling points of a property, a PCA can illustrate low deferred maintenance and cost per square foot to operate a property over an evaluation period. Lessees/Lessors – A PCA can be utilized to establish current conditions before a lease and are very useful for Triple Net Lease situations. Owners –A PCA can provide important property information to be used for capital or strategic planning as well as in insurance evaluations. Regardless of the transaction type, securing a PCA is always a good idea as it provides unbiased technical opinions of current conditions, deferred maintenance and replacement reserves/capital expenditures that will be needed to appropriately maintain a given property over a given term. Currently, ASTM2018-15 is the generally accepted industry standard, which provides guidance for the scope and content of a PCA. Visit BockandClark.com to learn more. Please welcome David Brewer as our new Western Regional Director. David will focus his time primarily in California and surrounding states. To contact him email dbrewer@bockandclark.com. Bock & Clark is pleased to again be a sponsor of the Dallas CASA Classic, being held April 30th. Dallas CASA is an organization of volunteers dedicated to advocating for abused and neglected children. Plan to stop by booth N1723 at the upcoming ICSC RECon show being held in Las Vegas May 20-23. Congratulations to Director of Marketing, Laura Hengle, for being named to the 2017 Midwest Real Estate News Commercial Real Estate Hall of Fame.